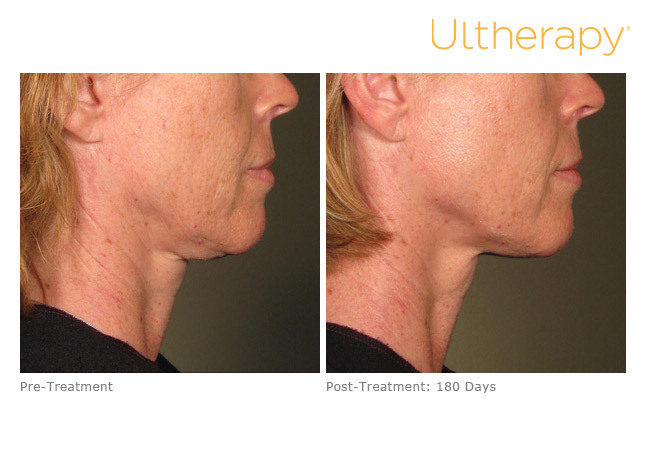 Ultherapy is a safe, non-surgical ultrasound treatment that counteracts the effects of time and gravity on your skin. 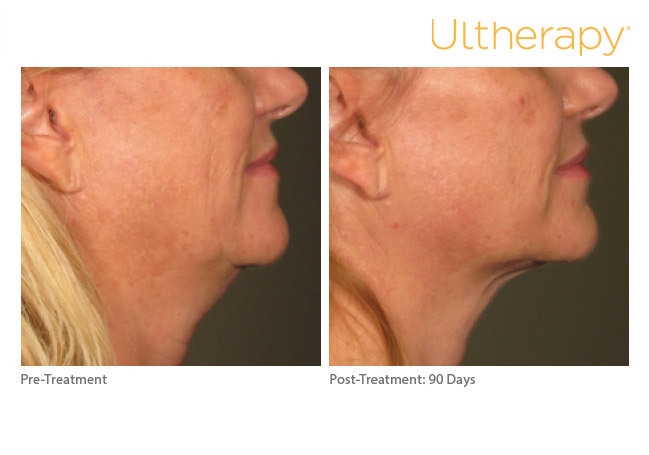 Ultherapy uses the body’s own regenerative response to gently and gradually lift and tighten skin as new collagen builds gradually over 3-6 months. The effects are remarkable. 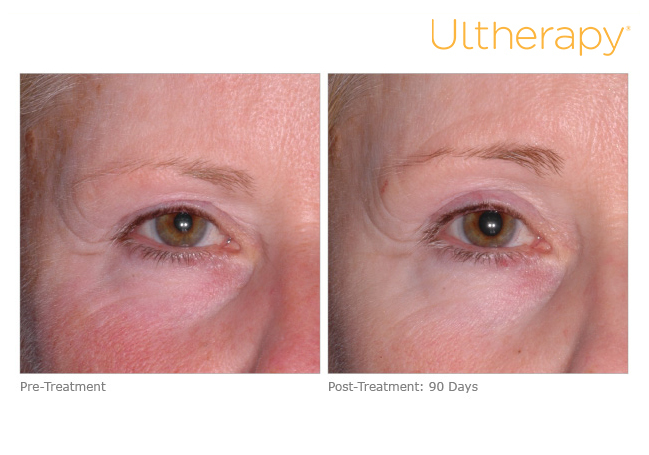 Ultherapy is the only non-invasive treatment cleared by the FDA to actually lift skin on the on the eyebrow, under the chin and on the neck, and smooth lines and wrinkles on the chest. The treatment deposits sound micro-focused energy – tried and true ultrasound – to a deep layer of skin tissue, where it stimulates the body’s ability to produce new collagen. 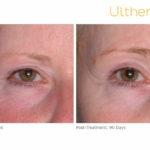 Can Ultherapy replace a surgical facelift? 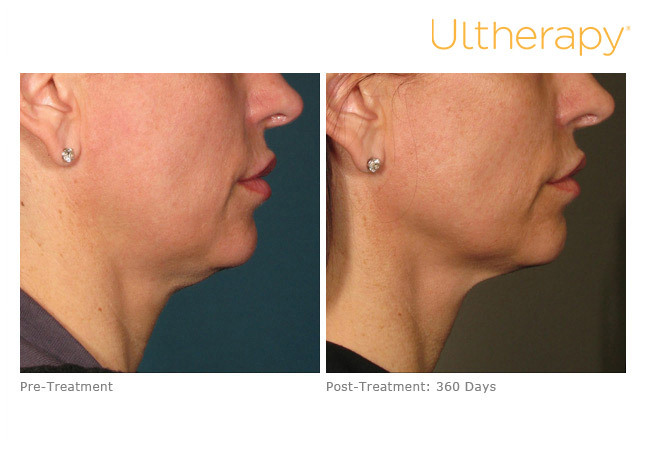 Ultherapy treats the same deep foundational layer of the skin that is addressed in a face lift, but it won’t duplicate the results of a face lift. It is a great alternative for those not ready for surgery, but even for those looking to extend the results of prior cosmetic surgery. Anyone who complains about their “jowls” or “sagging jawline” should ask their doctor about it. 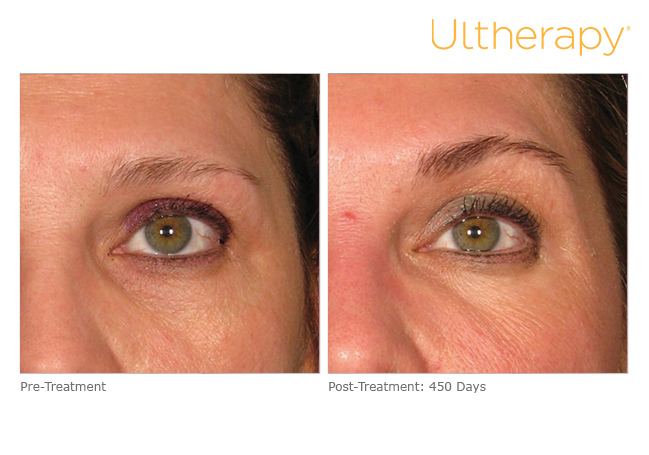 Ultherapy uses sound energy, which allows it to treat depths not matched by other non-invasive treatments. 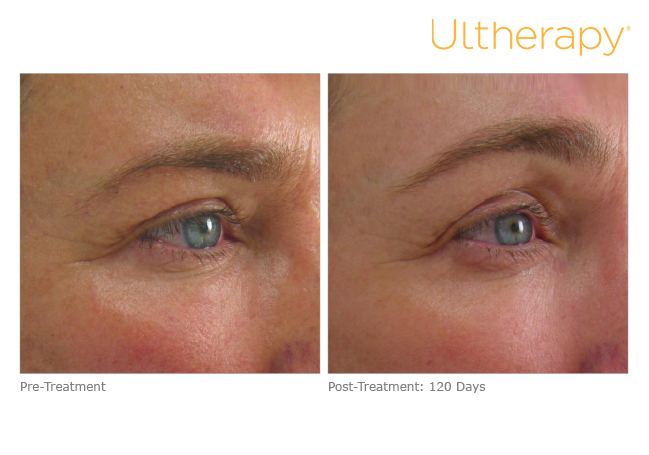 The ultrasound stimulates collagen production deep in the skin’s foundation, resulting in a clinically significant lift of tissue over 2-3 months. Lasers (like our Clear+Brilliant Laser and Profractional Laser) rely on light energy, which treat the superficial skin layers. Since the technologies treat different types of skin issues, they are very compatible. The micro-focused ultrasound energy deposited deep beneath the skin jumpstarts a natural process, known as neocollagenesis, producing fresh, new collagen. 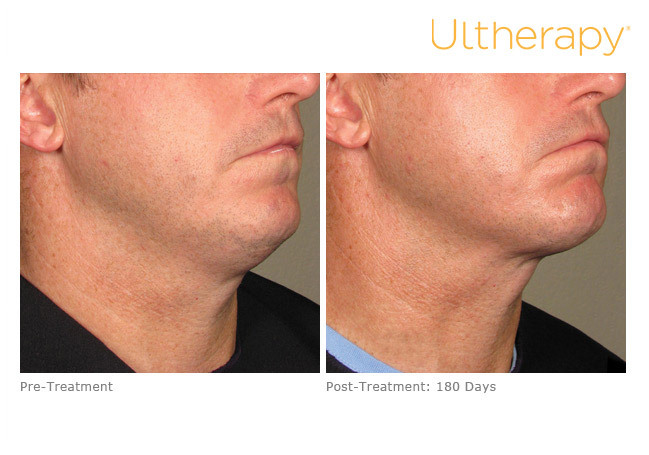 Ultherapy relies on your body’s own collagen building process for natural, noticeable results. The most common treatment area is the “lower face and jowls,” which generally takes about 90 minutes. That includes the facial regions known as the submental area and jawline up to and including the malar areas. 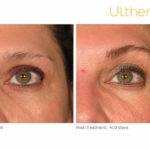 Adding on the upper face (includes lateral forehead and around the upper/lower eyelids) will add another 30-45 minutes to the treatment. Adding on the lower neck and/or upper chest will similarly increase the treatment time. There is no downtime. You can resume normal activities immediately. Your skin may appear to be flushed or tender at first, but that should disappear within a few hours. Comfort levels vary from person to person, but the sensation only lasts for the duration of the treatment. Oral analgesics are provided for all patients in the office prior to procedure. After your treatment, you may see some initial effect, but the ultimate results take place over 2-3 months, as your body naturally regenerates collagen. Most patients need only one treatment. However based on the degree of skin laxity and an individual’s collagen-building process, some patients might benefit from additional treatments, approximately two years after the initial treatment. Future touch-up treatments can help patients keep pace with the body’s natural aging process. 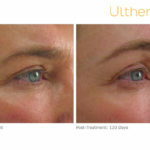 We recommend Ultherapy for patients who have mild to moderate skin laxity where the skin begins to look and feel less firm. Examples include a lowered eyebrow line or upper eyelids seeming a bit heavy, loose skin on the neck, sagging under the chin or around the jawline, and lines and wrinkles on the chest.